Laboratory of Cell and Molecular Biology, Department of Botany, University of Calcutta, Kolkata 700019, West Bengal, INDIA. From the ancient Vedic era, green plants are being used for their medicinal properties to treat several diseases. Green plants represent a big source of bioactive compounds. Alpinia galanga (Linn.) of Zingiberaceae family is one amongst those medicinally important plants. Different parts of the plant are used in the treatment of many diseases for its anti-fungal, anti-tumour, antimicrobial, anti-inflammatory, anti-diabetic, antioxidant, anti-ulcer and many other properties. Several active compounds such as 1’S-1’-acetoxychavicol acetate, 1’S-1’-acetoxyeuginol acetate, 1, 8-cineol, α-fenchyl acetate, β-farnesene, β-bisabolene, α-bergamotene, β-pinene, β-Sitosteroldiglucoside (AG-7), β-sitsteryl Arabinoside (AG-8), 1’-acetoxychavicol acetate (galangal acetate), p-hydroxycinnamaldehyde has been extracted from the plant. Relevant information was collected from scientific journals, books, and reports via electronic search using Medline, PubMed, Science Direct and Scopus. 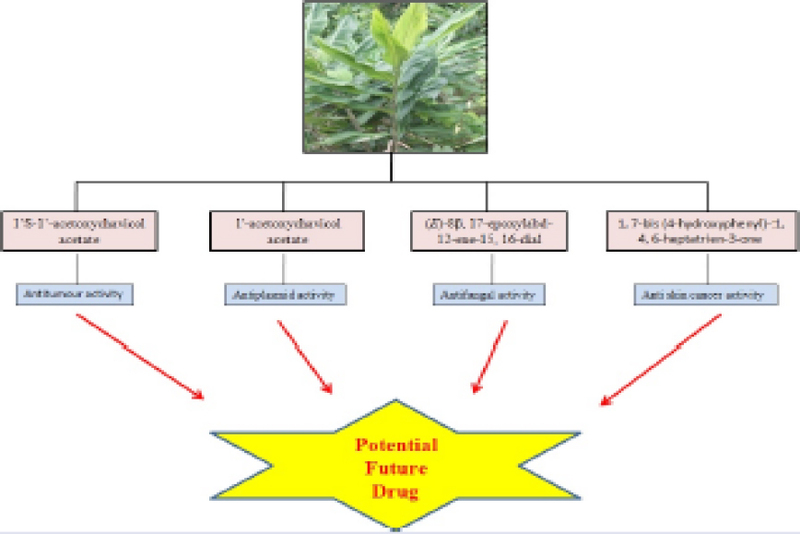 This review provides a comprehensive report on Alpinia galanga having anti-proliferative, apoptotic, anti angiogenic as well as cytotoxic efficacy and their mode of action in vitro as well as in vivo condition. Considering the ability of the golden treasure present in Alpinia galanga, this review is aimed to summarize the information of the chemical constituents, pharmacological and therapeutic effects of the plant. From the leaves, stems, rhizomes and roots of Alpinia galanga, presence of essential oil is reported. Those are mono and sesquiterpene as well as (E) - methyl cinnamate in nature. They are responsible for the characteristic odour as well as for the reported use in (folk) medicine and in food products of A. galangal. 5 Alpinia galanga contained flavonoids and volatile oils.6,7 The previous studies, the plant possessed many pharmacological activities, including antibacterial, antifungal, antiviral, Antiprotozoal,8,9 immunomodulatory, anti-oxidant effect, antidiabetic, antiplatelet, hypolipidemic and many other pharmacological effects. This review is a combination of chemical constituents, pharmacological and therapeutic effects of Alpinia galanga based on various current studies. The study of the literature review was carried out by searching on the electronic databases including PubMed, Science Direct, Scopus and Google Scholar for studies focusing on the biological and pharmacological activities of Alpinia galanga. All English-language articles published between 1976 and 2017 were searched using the terms ‘Alpinia galanga’, ‘greater galangal’, ‘Thai galangal’. The list of references of all the relevant articles was also studied to include all reports and reviews related to the subject. Alpinia galanga belongs to the Tribe Alpinieae of Alpinioideae subfamily under the Zingiberaceae family of Zingiberales order. Alpinia galanga is known by several synonyms such as Amomum galangal, Alpinia viridiflora, Maranta galangal, Languas galangal, Languasvulgare.2 It is known by several common names such as Kulanjan in Hindi, Dhumarasmi in Kannada, Kulingjan in Bengali, Kulinjan in Gujrati, Arattha in Malayalam, Pera-rattai in Tamil, Dhoomraasmi in Kannad, Pedda-dhumpa in Telugu, Mahabaracach, SugandhaVacha, Rasna in Sanskrit, Greater galangal in English. Table showing major bio molecules isolated from Alpinia galanga and their mechanism of action. Several pharmacological properties of Alpinia galanga. Chemical structures of the important bioactive molecules extracted from Alpinia galanga. Diagrammatic outlining of the mechanism of action shown by 1’S-1’- ACA and 1’-ACA. Compound 1’S-1’- ACA inhibit the growth of oral SCC by inhibition of NF-κB and 1’-ACA induces apoptosis by ROS generation in mitochondria as well as caspase-8 activation by FAS receptor activation. Green arrows and red down arrows represent activation and inhibition respectively. Nowadays it has been recognized that several diseases are caused due to the oxidative stress. Oxidative stress generates inside the living system due to imbalance of the formation of Reactive Oxygen Species i.e. ROS and their endogenous neutralization by quenching of the free radicals. Formation of ROS is an inevitable natural process. To combat the generation of oxidative stress exogenous antioxidant is necessary to neutralize the ROS. From the above mentioned characteristics of Alpinia galanga it is clear that the plant is potentially rich in antioxidant property. Hence Alpinia galanga may be used as a good source of antioxidant. Generation of ROS is also related to cancer development. Again, it has been seen that the plant exhibits good anticancer properties in several cell lines. Apart from antioxidant and anticancer properties, the plant has anti-diabetic, anti-inflammatory, anti-microbial, anti-fungal, anti-ulcer properties. So, it is clear that Alpinia galanga possesses rich phytochemical and pharmacological potentials. Compiling all the current knowledge so far we have regarding Alpinia galanga it is evident that the plant is a potential powerhouse of several lead molecules which are responsible for numerous bioactivities. Hence, isolation and identification of those lead molecules are needed for opening a new window in therapeutics of cancer biology as well as several other diseases. From the various scientific research based on Alpinia galanga, the plant has a huge biological potential. Several chemicals present in the plant shows a wide pharmacological and medicinal property. More research and evaluation needs to be done to isolate and identify different chemicals present in the plant which will be used for innumerable application for human welfare in the near future. Alpinia galanga (Linn.) is a medicinally important plant belongs to Zingiberaceae family. Chiefly the rhizome part of the plant is used in the treatment of many diseases for its anti-fungal, anti-tumour, antimicrobial, anti-inflammatory, anti-diabetic, antioxidant, anti-ulcer and many other properties. Several active compounds has been extracted from the plant which shows bioactivity. Isolation and identification of the bioactive lead molecules may be used in therapeutics of cancer biology as well as several other diseases. The authors are thankful to the Department of Biotechnology, Government of India for the financial support. The authors also thank UGC CAS programme at the department for support. 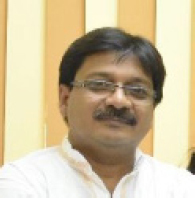 Dr. Santanu Paul is an Associate Professor at the Department of Botany; University of Calcutta; India. 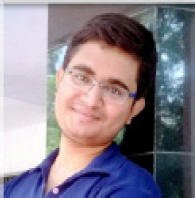 Anirban Chouni is a Junior Research Fellow at the Department of Botany; University of Calcutta; India.